Chris King is on a mission to help Florida youth—in danger of becoming victims of human trafficking—gain the knowledge to protect their rights and the rights of others. During the 15th Annual International Human Rights Summit, Youth for Human Rights International awards three stellar humanitarians for their work in changing the face of their nations. The 15th Annual International Human Rights Summit engages 94 youth from 57 nations at the United Nations in New York. Youth for Human Rights Italy holds its annual Human Rights Hero Awards 2018. The Youth for Human Rights Israel team seek to tackle the age-old conundrum of bringing harmony to the numerous ethnic and religious groups that make up their nation. The YHR Guyana chapter is tackling domestic violence at its roots, using human rights education and awareness to change the mindset of the country’s citizens. The 15th annual Youth for Human Rights World Educational Tour travels 35,058 miles through seven countries. Youth from across four different regions of the planet gather for Human Rights Summits. Cynthia Maria Guerra observed that her country of Guatemala was a nation of violence. She decided to team up with Youth for Human Rights and reverse the tide. A two-week Human Rights Education Tour travels to six cities in Taiwan to launch the 70th Anniversary of the Universal Declaration of Human Rights with enlightenment delivered through music and art—and inspiring thousands. Over 170 events took place in 40 nations to launch the 70th anniversary year of the Universal Declaration of Human Rights. Mother and son human rights advocates and educators adopt YHRI campaign. Youth for Human Rights Mexico partners with Department of Special Education, training 700 educators to deliver human rights lectures to more than one million students. In the midst of turmoil, Issa Suffy brings sanity through teaching the Universal Declaration of Human Rights. International conference brings together human rights advocates from six nations. Selected for their accomplishments in the field of human rights, 66 young men and women participated in the 14th annual Human Rights Summit of Youth for Human Rights International, held in New York. Through creative out-of-doors lessons and classroom sessions, Duke Ifeaka’s human rights movement in Nigeria is sweeping up everyone in his campaign for peace. Radio host Kerri Kasem, daughter of Casey Kasem, shares her personal story and struggle to get human rights guaranteed. ©2002–2019 Youth for Human Rights International. All Rights Reserved. 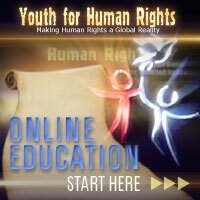 The Youth for Human Rights International logo is owned by Youth for Human Rights International. The UNITED logo is owned by TXL Films and is used with its permission.